tutorial | Tiffany Loves Cake! 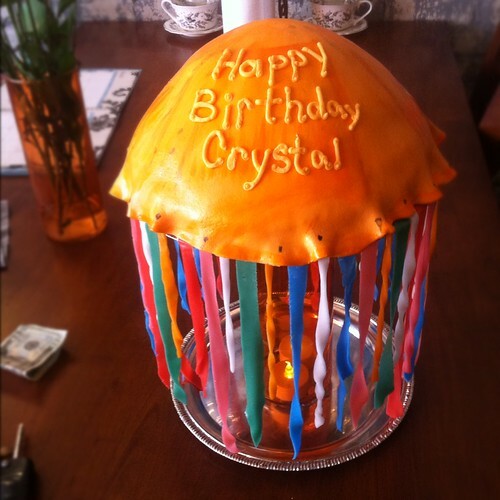 My best friend has always wanted a jellyfish. I can’t afford to give her such a gift, so I went with what I know! 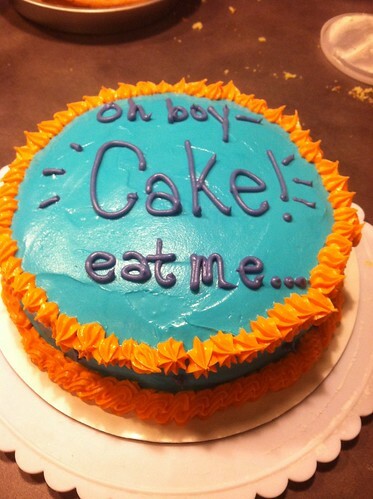 Cake, of course. I knew to make this work I would need to build a stand. 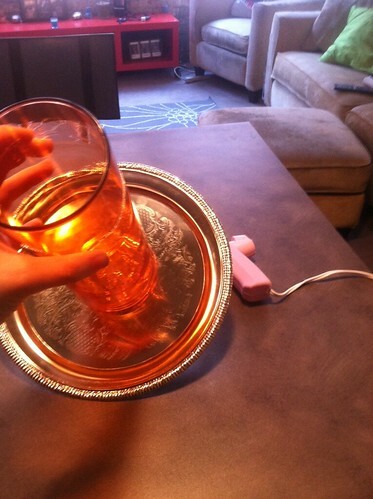 I purchased two metal plates and a clear orange glass vase. I hot glued these together to make a stand. 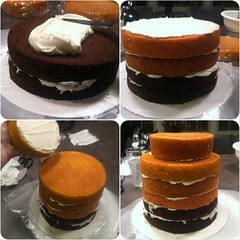 Make sure your top plate is the same size as your cake. I dropped two battery operated tea lights in there. Thankfully, they stayed lit through the party, which was hours later! 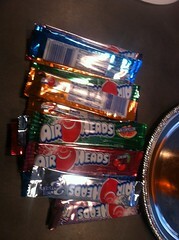 I used Airheads candy. 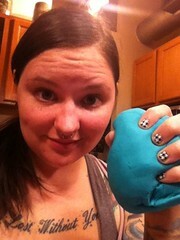 I didn’t think fondant would hold up. I assumed it would tear and droop. 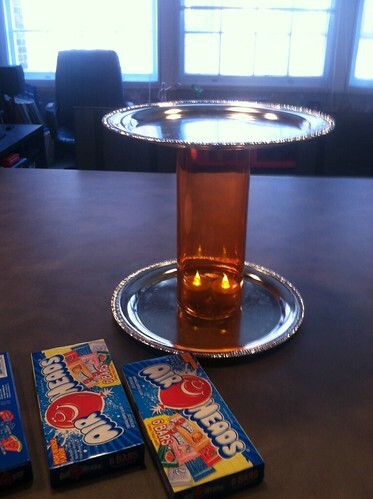 I microwaved each piece of candy for four seconds (based on trial and error, 5 seconds was too long, believe it or not. 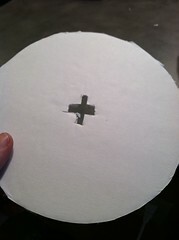 )… Then rolled it into a thinner strip. 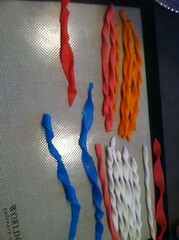 I cut those into smaller strips and twisted them, setting them aside to cool. 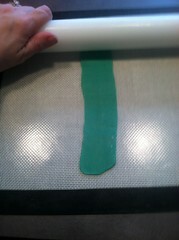 Each strip I then attached to the top plate with melted white chocolate. 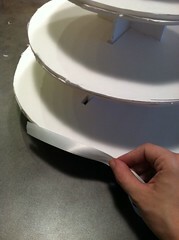 This will harden and hold the strips firmly in place. 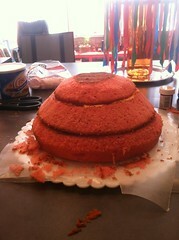 Next I went to work on my cake. 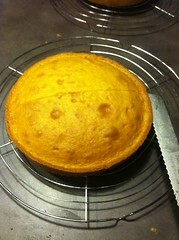 I baked three cakes in decreasing size in order to carve a dome. 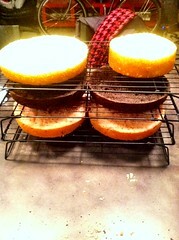 The bottom cake is the same size as the plate on top of my stand. That is important later. 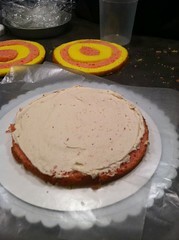 I placed the cake on a board that was slightly smaller than the bottom layer. 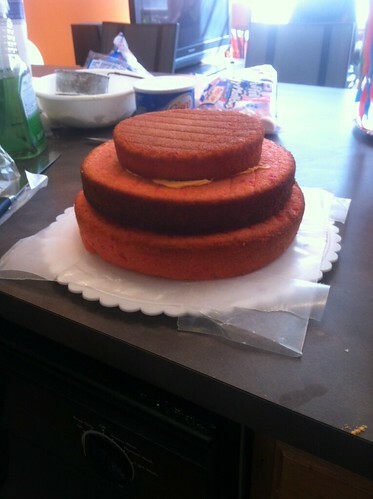 That way I will be able to easily lift the cake on to the stand, but it will also sit flush on it. 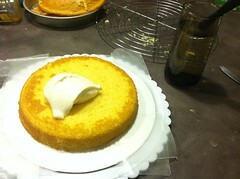 I carved the cake and iced it. 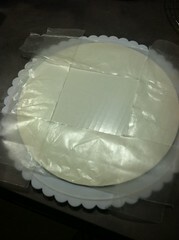 Next, I elevated the cake and laid the fondant over it. 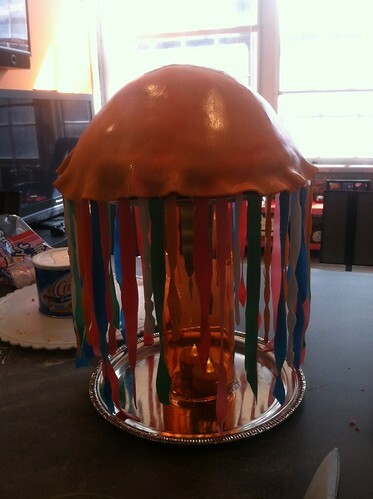 I trimmed it to hang slightly over the cake so that it would cover the stand plate and have the fluid jellyfish look to it. 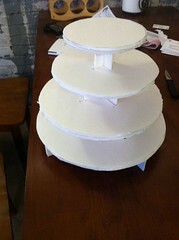 I pleated it a bit and then transferred the cake to the stand. 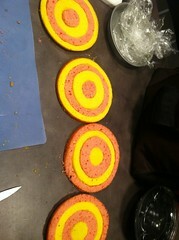 Once on the stand I hand painted some details with food color gel mixed with high proof vodka. I even sprinkled a bit of luster dust over it. I piped a happy birthday message for the birthday girl and it was done! 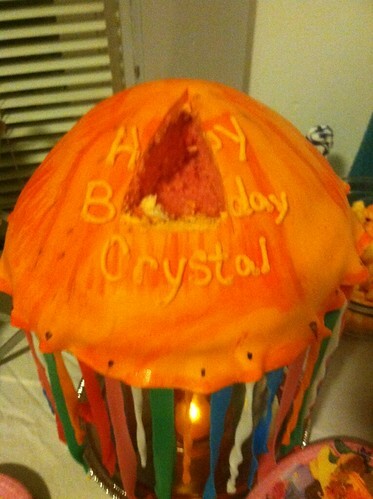 It was a huge hit at the party. 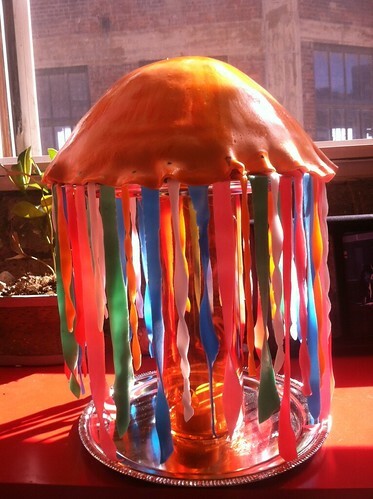 Everyone loved pulling the tentacles off and eating them with their cake! Well, it’s my very own birthday on Monday. I’ll be… twenty- eight. Woo. I had a brief moment of panic lying in bed last night thinking about how tragically old I am and how I’m going to be ancient and dead any time now. Then I realized I’m not even 30 yet and I’m making myself a cartoon birthday cake and I’m going to drink like a 21 year old tonight. Then I felt a little better. 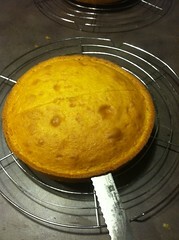 Anyhow, on to the cake! 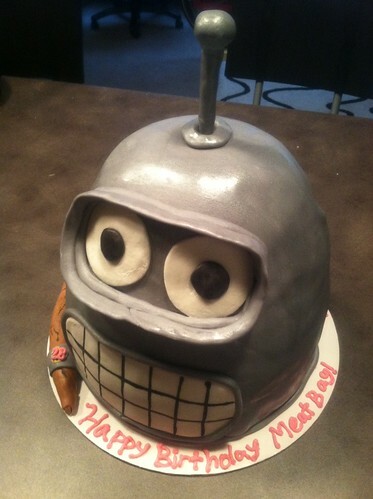 My favorite show of all time is Futurama. And my favorite character on that show is Bender Bending Rodriguez! 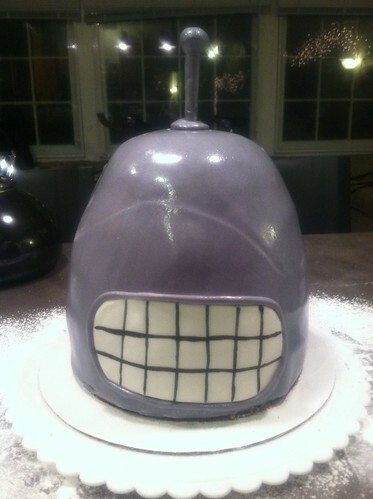 So, first of all, this is my birthday, and I’m the cake chick… so my cake has to be awesome. 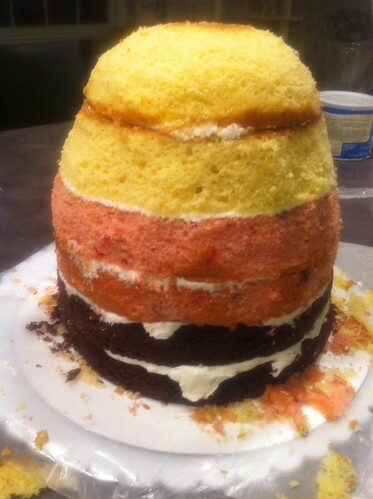 I started with 6 layers of cake. Chocolate, strawberry and vanilla! I leveled them and stacked them. This thing is like a foot tall and weighs a ton. I stuck it in the freezer for a bit before carving it. 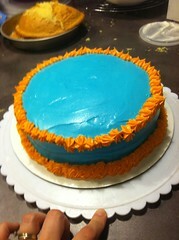 This was not an icing job for the faint of heart. That’s for sure. 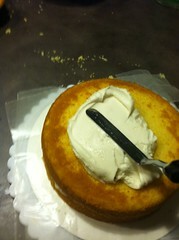 All that exposed cake is hard to frost without tearing if you aren’t experienced and using the proper tools. I had to keep heating my spatula in hot water, it turned out well though. 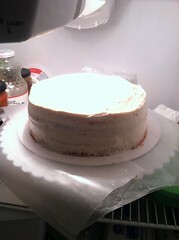 I set it in the fridge to cool a bit while I rolled out the fondant. My fondant ended up with a weird line in it from when I rolled it onto the rolling pin, but it’s ok, his eyes will cover that. 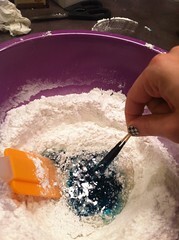 I mixed up some of my edible silver and painted the whole thing. Then I added a mouth, which I drew on with food color markers. Starting to look Bendery! 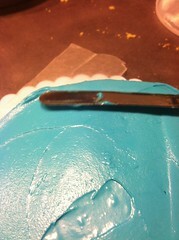 Also, I added his antenna which is part of the dowel I pushed into the cake to keep it from sliding around. 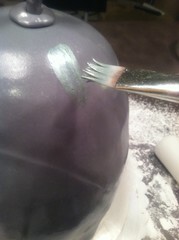 It’s just a wooden rod I covered with fondant on top. I’d LOVE to show you my process of making the eyes, but it was a mess lol. First, I cast eyes out of white chocolate, but they turned out to be too small… so I went with these. It was okay, but the visor was really hard. I ended up sort of stacking two fondant ropes around the eyes. It’s not perfect, but it worked. I also made a cigar, of course. 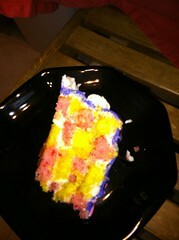 This was my first attempt at a checkerboard cake. If I could do it all again, there are things I would do differently, for sure. So keep an eye on that commentary. I’ll say this is a more advanced project. 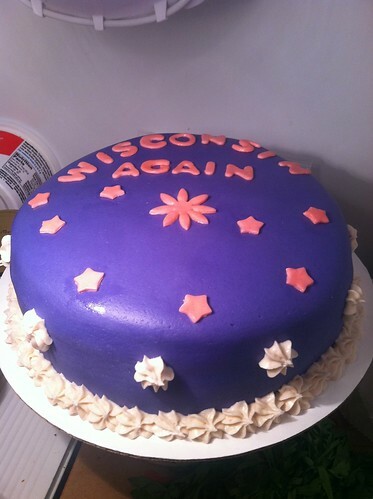 If you’re not already pretty great at frosting cakes, this probably won’t end well for you. 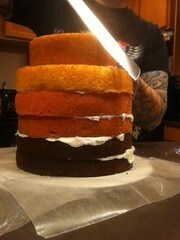 I started with two different color cake layers which I then sliced into four thinner cake layers. Mistake #1. 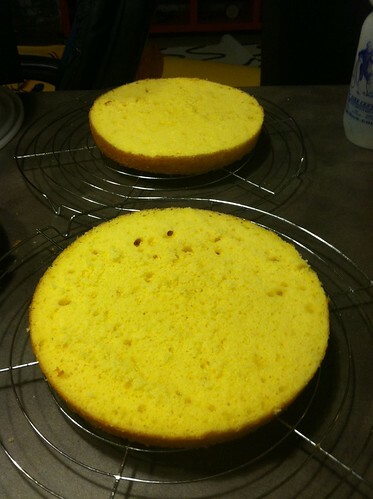 I either should have made four layers the original size… or I should have just worked with the two layers as they were. 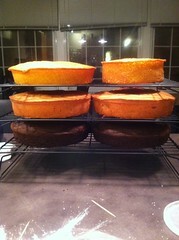 I let the cakes freeze for a while so they’d be easier to cut. Then I found some round things… like bowls and containers that I could use as guides to cut rings out of the cakes about two inches apart. 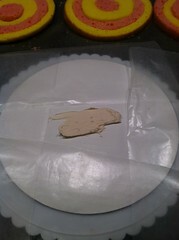 I arranged my layers and then put some wax paper on my board and some frosting to hold down the first layer. 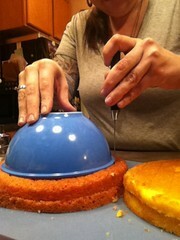 Carefully place each layer and carefully frost the top of it. 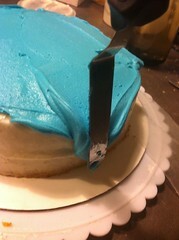 Using hot water on your spatula will help you to keep from shredding the cake. 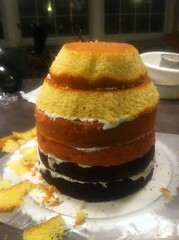 Stack and frost each layer. Don’t forget to alternate color schemes. It’s a labor of love. 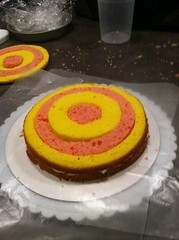 From there I chilled the cake for a while and then covered it in fondant. If nothing else, strawberry and lemon always taste wonderful together. I had a great time this weekend in Wisconsin with my bff Liz. If I get time, I’ll add some great photos from our trip at the end of this post soon! 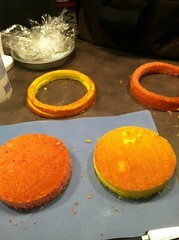 Gum paste and fondants are two different things. Fondants is softer and doesn’t dry hard. 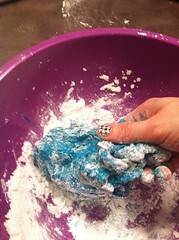 Gumpaste will dry and harden to create decorations that really hold up. 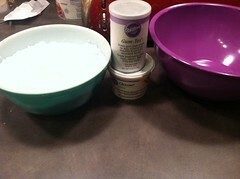 You only need a few things to make gumpaste. 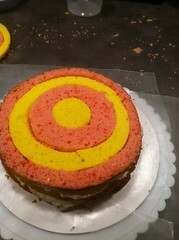 Wilton makes gum-tex and glucose which you can find at almost any craft store’s cake decorating aisle. 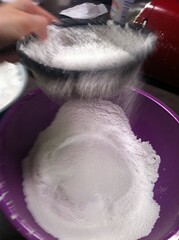 First, sift together THREE cups of the sugar with 1 tablespoon of gum-tex into a large bowl. 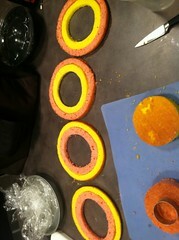 Next, you’ll want to make a well in the center and set it aside. 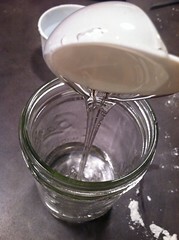 Next, mix one tablespoon if glucose with 4 tablespoon of warm water in a glass container. I had to scrape my tablespoon out with another spoon to get it all in there. 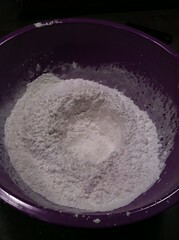 Now stir it a bit and pop that in the microwave for 30 seconds. Then pour it into your well. 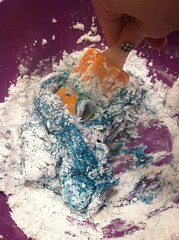 Now start mixing from the center with a silicone spatula. 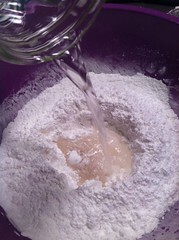 Much like when you make dough, incorporating the liquid into the dry ingredients a little at a time. 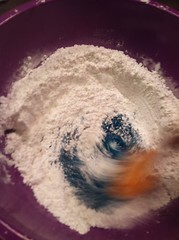 Once you’ve almost reached the edge of your dry ingredients, add any food coloring you’d like to add. 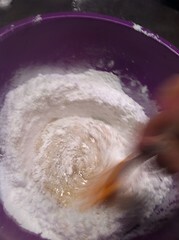 Then continue to stir and mix until you can knead your mixture. 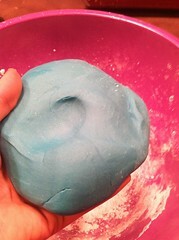 Keep kneading until your gum paste becomes a satin finish, pliable ball. 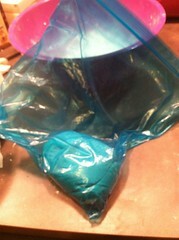 Now seal it tight in a ziplock bag and let it sit for 8 hours or over night at room temp. 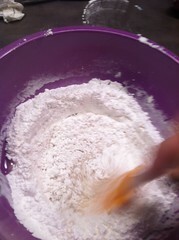 When you’re ready to use it, mix in the last cup of powdered sugar and knead well. 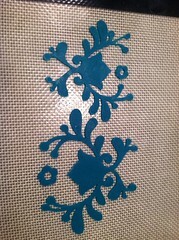 I’ve already had great results with my Cricut cutter! 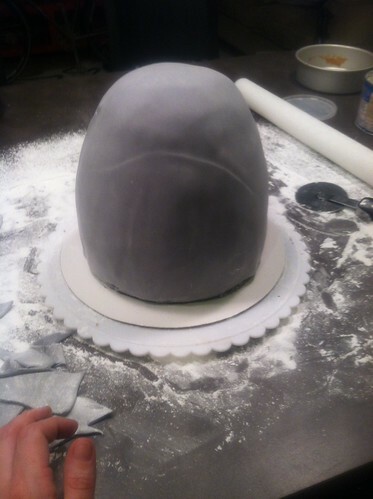 So, I’ve had many requests for a tutorial on fondant figures. To be honest, I’m not so great with them. I suppose mostly because I never really make them! Well, it might seem a bit unusual, but I was scouring the web for something else the other day when I stumbled upon quite possibly the best fondant figure tutorial I’ve ever seen in my life. I was so excited about it. It made me feel like anyone could read it and make a pretty rad figure. Immediately, I wanted to share this information with you all. The blog is Eat the Evidence and you can find this wonderful tutorial HERE. I know it seems silly to outsource a tutorial, lol, but seriously, I could never do it better than this and I’m not about to steal someone’s work and act like I came up with it. 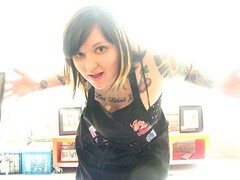 Upon more reading of her blog, I discovered that I’ve seen her work and I am already a fan of hers! And she lives in Austin. 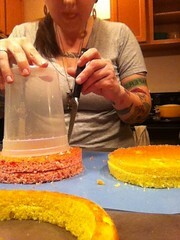 I’ve lived in Austin and for the record, I couldn’t imagine making cakes any place more humid than here in Ohio. 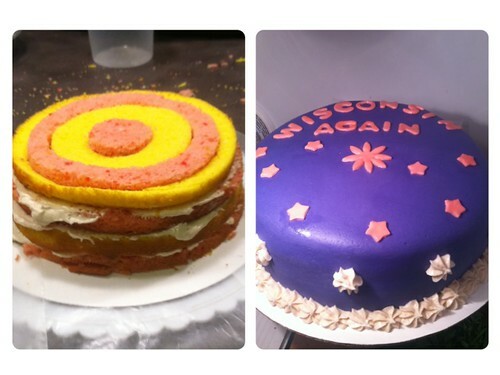 Whenever I see people who make cakes in these hotter places, I am just in awe of them. Well, maybe some time tonight I’ll have time to try to make a figure based on this tutorial and I can show you guys what I made! Until then, please check out her blog and enjoy that epic tutorial! Don’t worry, I have A LOT of stuff coming up. 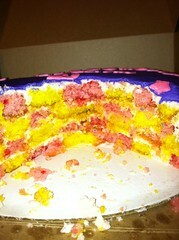 I’m going to have cake coming out my ears!! 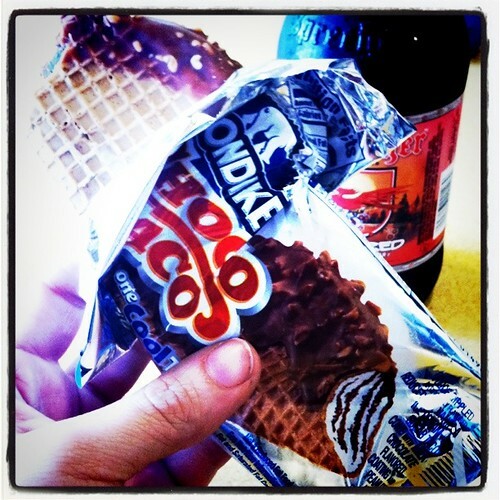 For a distraction, here’s a photo of a choco taco I ate last week. It was delicious. 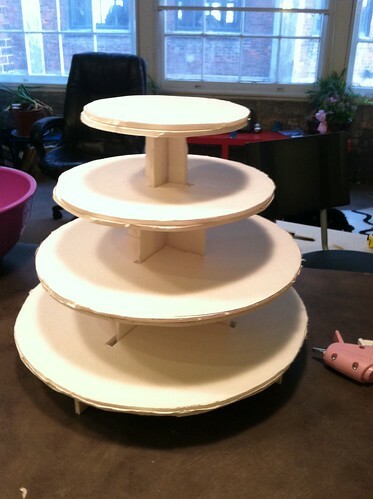 Let’s make a cupcake tower like the one I used in this post! Alright kids, it’s another late one here at the Whitten house… trying to crank out helpful cakery tips for you guys to keep you informed. Two things first… one you may have noticed the new TUTORIALS tab at the top of the page. Yaay! I spent a little while painstakingly placing all of the tutorial links on that page with a photo for each. Much easier to access now. Wowy, it’s like I’m getting all organized. 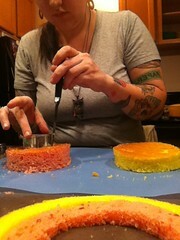 I’m going to work on a cake gallery next, but gosh, it’s going to take some time!! Second, you might notice this is sort of a tutorial I did before. I just have had a lot of questions since then and I wanted to do a more clear version of it. I hope this helps! Since last time I was making sort of a wacky/whimsical tower with odd shapes, I wanted to show you a more basic version. You’ll need a few things to start with. 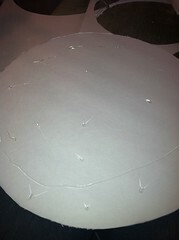 *Something to trace- I used lids from some bowls that I have to trace for my tiers. 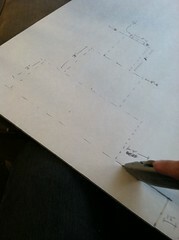 If you want to make squares, you might be able to just measure them out. More power to you. 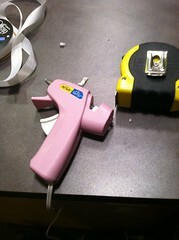 *Exacto knife -please be careful with this! Only responsible adults should use these. Have one help you if you are not one. *Ribbon- of your choice to go with your project. 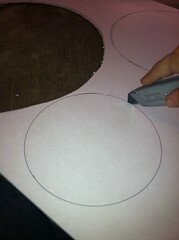 Start by tracing TWO of each circle onto your foam core and cutting them out. I’m doing two in order to make a very sturdy tower. 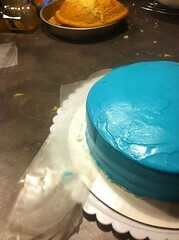 They’re not going to come out perfect, I know. Unless you’re some kind of precision robot, just do the best you can. Don’t worry. 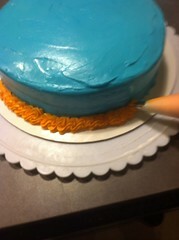 We get to cover those edges up later with the ribbon! 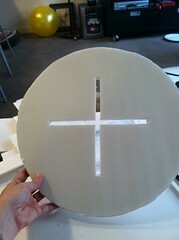 Next, hot glue your circle pairs together. 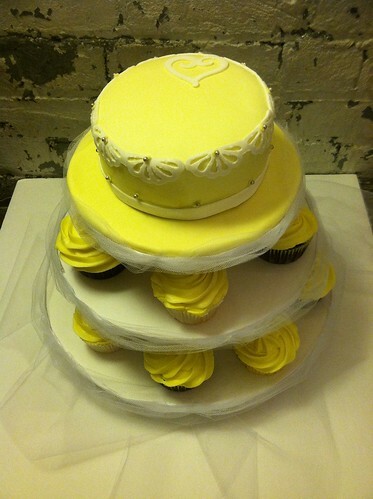 Except for the top tier! 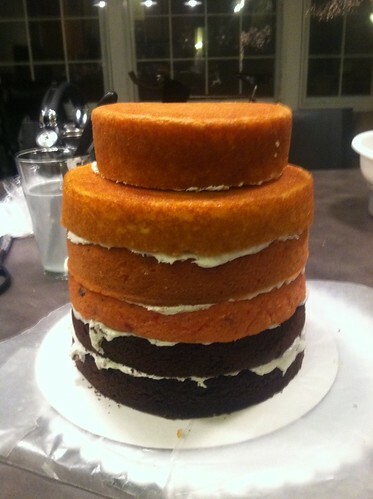 We’ll deal with the top tier later. Here’s where I don’t want to lose you. I’ll try to make this make sense… really. 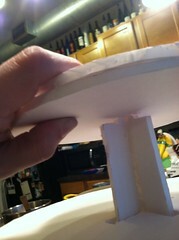 to make the center supports steps for the tiers, measure your bottom tier. You’ll want your bottom step to be that length or just short of it. That step should only be about an inch tall. 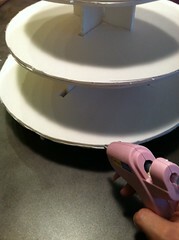 The next step, should be slightly smaller across than your next tier, and should be at least 3 inches tall, since a cupcake has to sit under the next one. 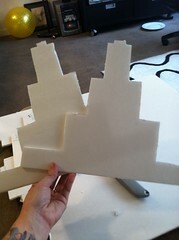 The next step, should, again, be just slightly smaller than the next tier, also, 3 inches tall. Keep in mind, each tier will be sitting on their respective steps and need to be supported, but not hanging way over the steps. I truly hope this this making sense. 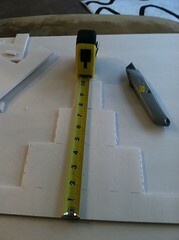 For my top step, again, I made it 3 inches tall and then put just a tiny 1/4″ step on top of that. I’ll explain that further on. You’ll need to cut out two of these. 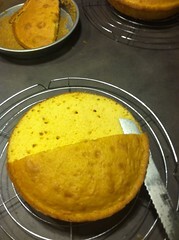 Now, you’ll want to measure and cut half way up one and half way down the other. 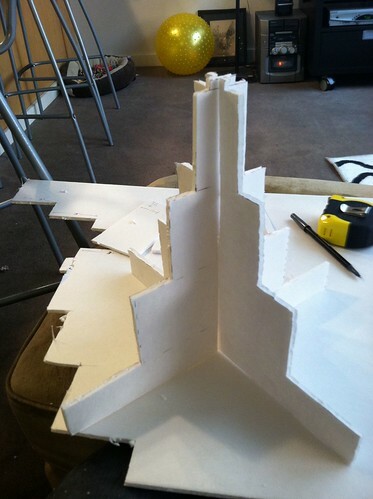 You might need to tweak it a little bit to make it work, but you want them to fit into each other and sit level. If it’s a tad loose feeling, don’t worry, we’ll sturdy it up later. Now the hard(sih) part is up. 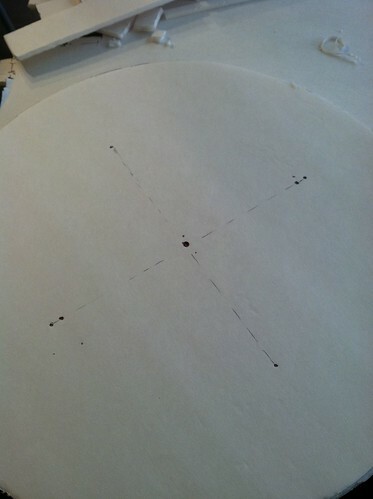 You’ll want to find the center of each of your rounds and mark off and cut out an “X” from each one. (except that top part, we’re getting there, don’t worry.) You’ll want to cut the “x” wide enough to fit over the frame you build. Basically, this bottom one needs to fit over that 2nd step. 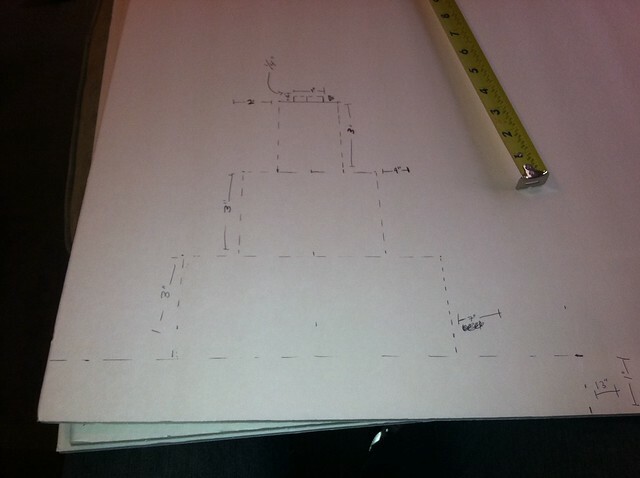 DO NOT get confused and cut the “X” the size of the bottom step. That’s the step it rests on! It only needs to fit over that second one. Does that make sense? 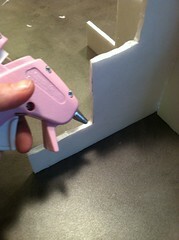 Make sure you’re only cutting them to fit over what they need to fit over and rest where they need to rest. 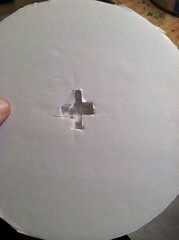 Now, if you’d like, you could just put the top two rounds together and cut them this way as well. With just a tiny “x” small enough for that top tiny portion of the stand to fit though. Or you can try this. 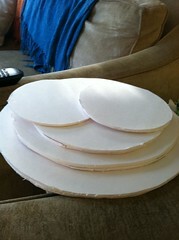 Cut one round the way you cut the last ones. The next one… try to only cut half way through. So that you still have a smooth uncut top portion. Glue them together so that the “x”s are lined up, of course. Stack your tower by sliding each round over the steps, guiding the last one on top. Ta-da! Okay! So, now that you know it all fits together… (it all fits, right? No? Okay, well go re-do the stuff you messed up like I did the first time and then come back to this step…) let’s make this more permanent! 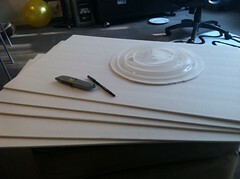 Start gluing things up. Put some glue in the frame and stick it together. Follow the lines up and down and glue those two pieces together where they connect. 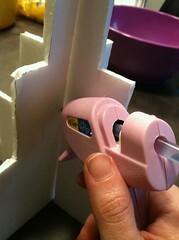 Fill in any gaps with glue. 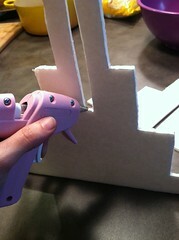 Next, add glue to your steps tops and quickly slip your rounds onto them. Flip it over and glue them more on the bottom as well. 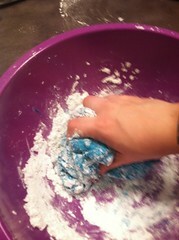 Now it’s time to deal with those rough, ugly edges! 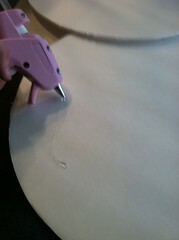 Glue your ribbon on the outside of your rounds! You can use whatever ribbon you want! 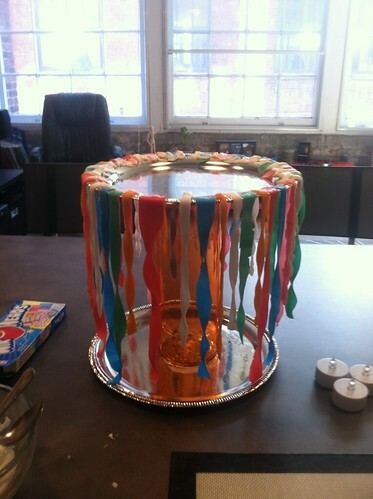 And before you put the whole thing together with the glue, you could decorate each tier however you want. You could cover them with cute paper, paint them, bedazzle them, etc etc! 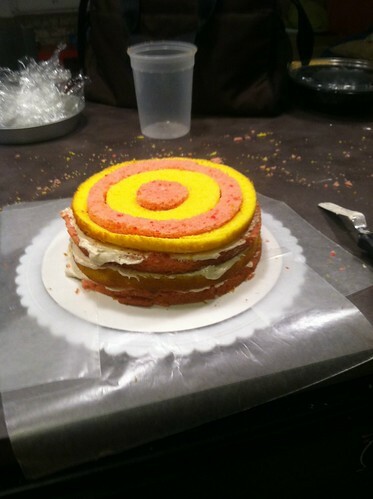 Also, while cupcakes will probably cover the rough edges on the stand itself, but you can always run ribbons over those edges as well. Be creative!! 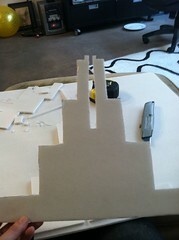 This tower is for someone and I make a point to never show finished work until the person it’s for has seen it! It’ll be worth it though. This thing is getting decked out!! Alright, so I REALLY hope you’ve learned something today and PLEASE, ask any questions you have. I’m hoping I made this so that it makes sense! I get tons of google hits every day for my previous post, but I think this one will be much more informative for those looking for better steps! Ok, so today is the most basic. How to do these simple starter bits. I know what frustrated me the most when I first started teaching myself, so I’ll try to cover these things. Start by leveling your layers. I showed you how to do this here. Here’s a bit of a refresher though. 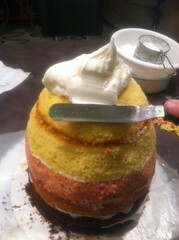 Remember, score only to the point you want to level, then carefully remove the top. Or whatever leveling technique you feel comfortable with. You MUST level it though. 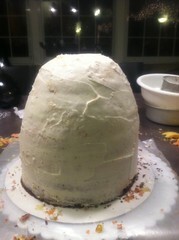 Don’t stack dome-topped cakes. 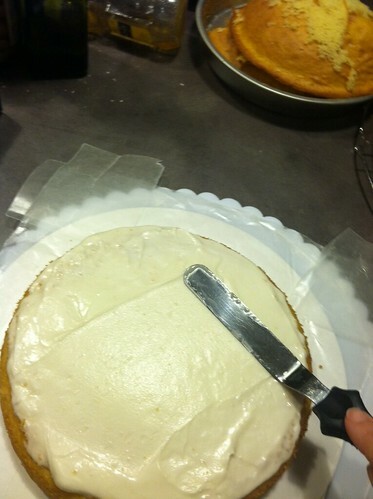 lol Also, PLEASE, let your cakes cool before you do anything. 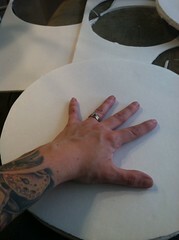 Next, place strips of wax paper on your cake board. 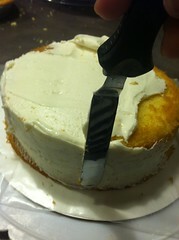 You’ll put the cake over them, you just want to be able to pull them out from under the cake when you’re done. They’ll protect the board from rouge icing globs. 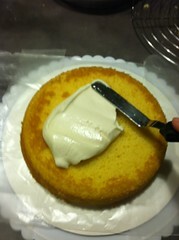 I suggest the Wilton buttercream recipe for your icing. 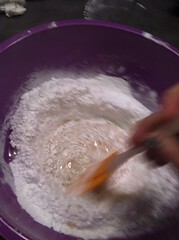 Now, we start the crumb coat. 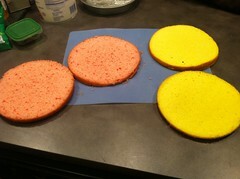 Whether you’re doing fondant or buttercream as your final product, you have to master the crumb coat. 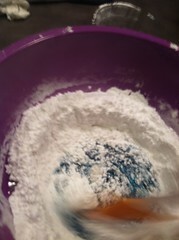 Remember when you were a kid and you’d get out that tub of frosting that was either too stiff because it’d be put in the fridge or too goopy because… well, because that’s just how it is, and you’d dip in your butter knife and try your very hardest to smooth that glop across your un-leveled cake, shredding the sides as you went. Maybe you didn’t even let the thing cool first. I mean… I have those memories lol. 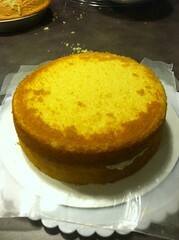 If only I’d known about the crumb coat! 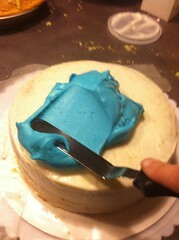 Once it’s pretty smooth in there, go ahead and place your second layer on top. Keep that hot water in mind, don’t forget it’s there. Use it often. 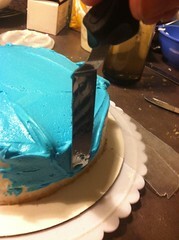 You don’t want water dripping all over your cake so tap off excess water, but seriously, keeping your spatula hot will keep your frosting happy. 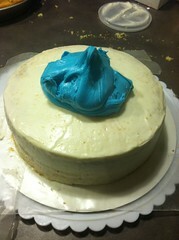 Glop some icing on top. Don’t be shy. If you don’t have enough on there, you’ll be frustrated. 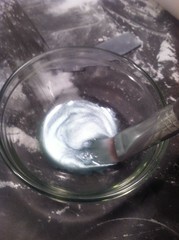 Start smoothing. Keep your spatula hot. 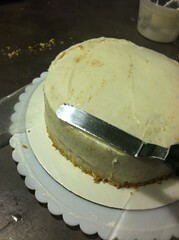 This is a thin coating of frosting and you want it to gather the loose crumbs and hug that cake! Cool. Now, toss it in the fridge just to set up a bit while you prep for round two. 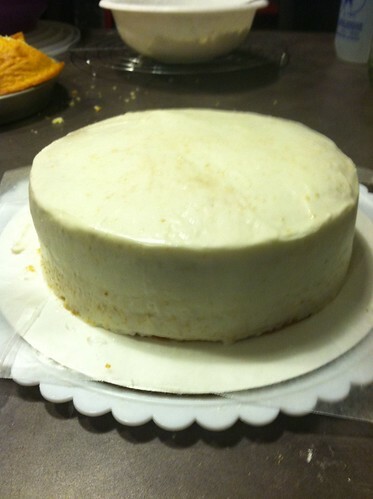 From here, this cake could be covered in fondant as shown here… or you can cover this cake with more buttercream. I’ll be showing you that now. 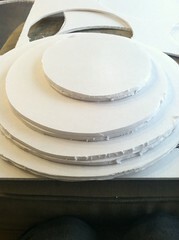 I like to crumb coat in white, but you can now cover with whatever color or flavor you like. I’m using blue. 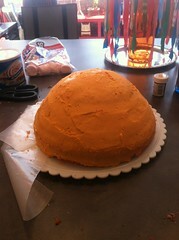 Again, a big glob on top. This is where you want to be very liberal. Really glob it on. 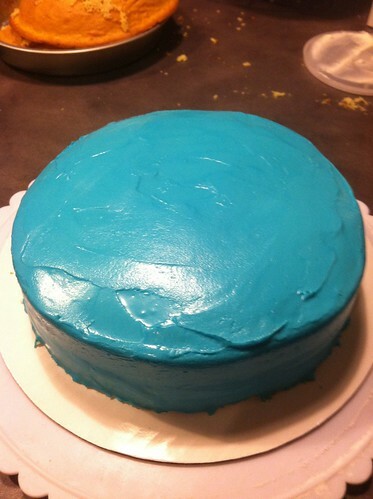 The first time I iced a cake, I didn’t have enough frosting and I was so frustrated. And I can’t stress that hot glass of water enough. You might even want to refresh that glass, the temp has probably gone down some by now. 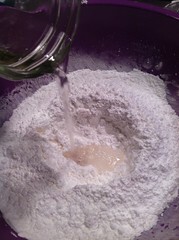 Start this the same as the crumb coat. Glob it on and smooth it out. 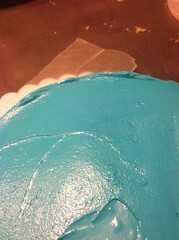 Little lips on the edges like this can be smoothed inward. Not bad, not bad. I could make myself crazy trying to make buttercream look fondant smooth all day, but I am not that good with it, so I don’t bother. This is good enough for me. 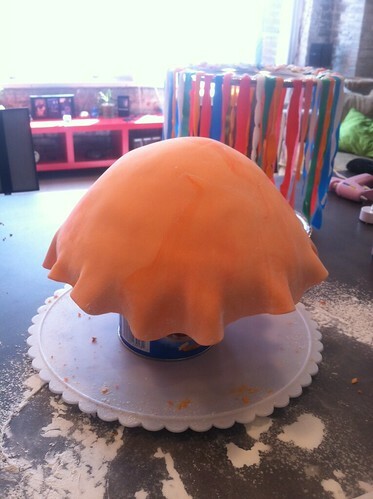 Icing is an art. And I’m just a tourist in the buttercream world. 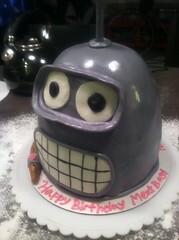 Fondant is my deal haha. 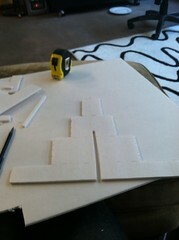 Now, as for all those bottom parts and top parts that aren’t perfect, that’s what boarders are for silly! 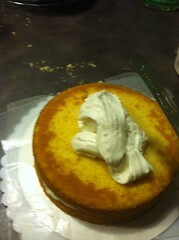 My buttercream was a little thinner than I like to use it here. Possibly because I threw in some cream cheese. Ah well. Still not bad.